Knowing why an asset failed and you’re most of the way towards avoiding it happening again. Sounds so simple but this important part of Asset Management is often overlooked. There are various steps taken in the event of an asset having failed and from CPM’s experience, almost all plant operators have their own preferred methods of performing this exercise. We are not dealing with identifying the failure, the systems of reporting or even the corrective actions, we are talking about how an Electro-Mechanical Service Provider can help in identifying the problems through Root Cause Failure Analysis (RCFA). RCFA of course encompasses many aspects of the application of the assets but an Electro-Mechanical Service Provider can provide valuable information on why the asset failed which, when used with a site investigation, paints a more detailed picture. Conclusions can then be drawn from it and decisions made to avoid a reoccurrence, extend MTBF (Mean Time Between Failures) and increase productivity and profitability. So, what information can be provided by the Electro-Mechanical Service Provider? 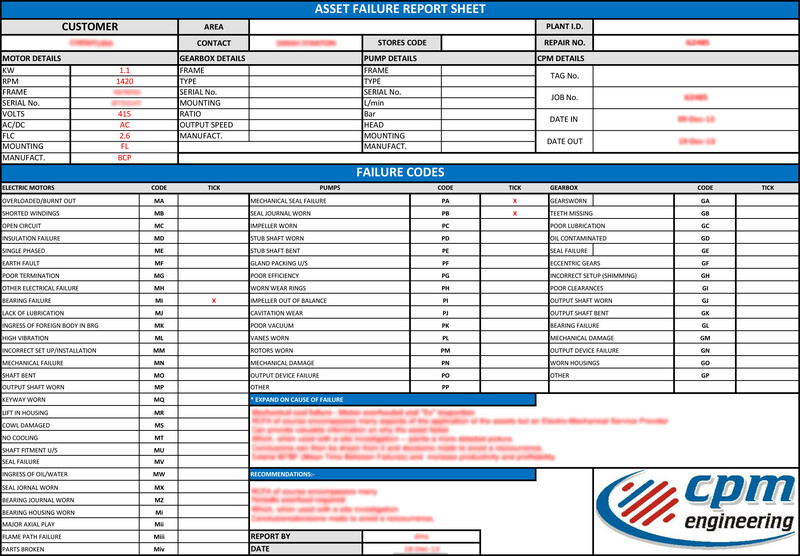 When evaluating a failed pump, gearbox, electric motor or the likes they can provide information about why the machine failed. It could be simple component wear such as bearings, seals, or gaskets, it could also be issues of alignment, balance, resonance, contamination, or an electrical failure such as ‘single phasing’ or overload. 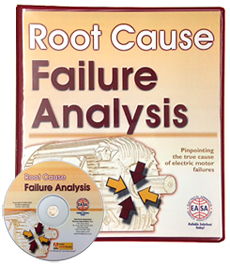 In order to detect these types of failures CPM use a Root Cause Failure Analysis (RCFA) system which their engineers are trained to use. It not only looks at the primary failure but also cause and effects. RCFA identifies the cause to help prevent a recurrence of the failure. Your Electro-Mechanical Service Company can meet these expectations by performing repairs in conformance with Recommended Best Practice for Repair of Rotating Machines; and by providing RCFA in accordance with this proven methodology. Once this process has been completed, the information can then be fed back to the customer, who can then make an informed decision about the changes that may be required to the plant to avoid a repetition. This feedback is in the form of an Asset Failure Report Form. 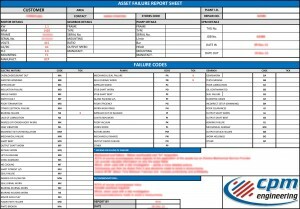 This document contains the observations of the skilled engineer who tested the machine, the conditions of the machine on receipt, test results compared to when it was purchased new, the levels and patterns of component wear, the lubrication and its delivery system, gaps and clearances etc. But perhaps the most beneficial of the Asset Failure Report is its conclusions. Why did the machine fail? What were the forces which contributed to the failure? Was it premature? And what is the best cause of action to extend the life of the machine? Repair? Replacement? Modification? Change in maintenance practices? For more information on how CPM helps its customers to extend MTBF, call us now. "I' m really glad I gave CPM a try. After dipping my toe in the water trying your services, you've really impressed me. Always turning the work around really well."